Fierce demand, skyrocketing property values and residential encroachment are making industrial land a scarce commodity in Metro Vancouver. How can the region avoid losing this key economic building block? Peter Spotzl runs a small metal fabricating business in Vancouver’s Mount Pleasant neighbourhood. Since 2016, he’s watched the tax bill for his leased property surge by a whopping $20,000. Spotzl says he now pays $83,000 in taxes annually, thanks to the escalating assessed value of the 8,000-square-foot shop—from $5.4 million to $7.6 million in the past year alone. Metal & Wood Products Ltd., a fixture on East Third Avenue since the 1930s, is one of Vancouver’s few remaining metal fabricators. Others have moved to the suburbs or cashed out, and Spotzl fears he may have to head east, too. Being centrally located is a selling feature for his operation, which focuses on the high-end housing market. The 18-employee company makes staircases, gates, fences and railings for customers on Vancouver’s west side and in West Vancouver. Not that most people will notice. 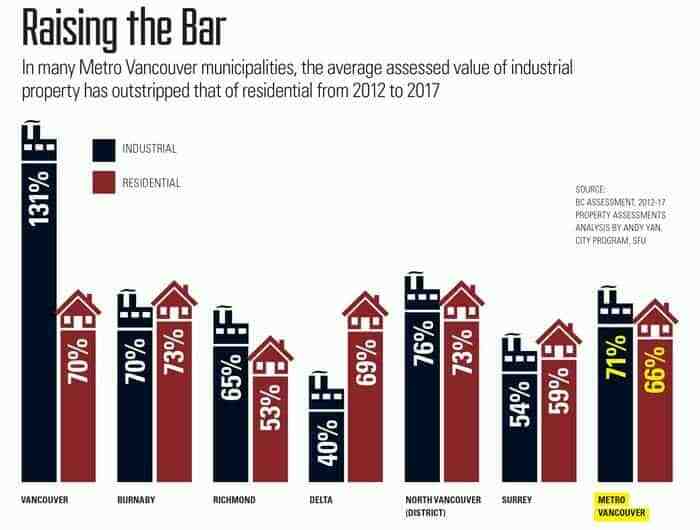 As Vancouverites obsess over housing prices, industrial real estate has quietly outpaced residential. That’s bad news for businesses like Spotzl’s. Rising land values mean rising taxes and higher operating costs. If small and midsize companies get shut out of the market, job losses will follow. Dwindling parcels of vacant industrial land means local ports can’t expand—and Metro Vancouver can’t compete. If or when land runs out, the economic implications would be dire. Lonnie Neufeld, an industrial land expert at Vancouver-based tax consulting firm Burgess, Cawley, Sullivan & Associates Ltd., says the region has already lost major distribution centres to Calgary because space couldn’t be found. The goods are shipped to Vancouver by container, sent by rail to Calgary and trucked back to Vancouver—hardly sustainable, but cheaper than trying to set up distribution from B.C. Andy Yan, director of the City Program and an instructor in community data science at SFU, tried to create a map of industrial land throughout the region, but the results were so sparse that they looked like a constellation. “It’s really surprising how scarce industrial land is in the region,” he says. This isn’t just a Vancouver phenomenon. For example, the value of Richmond industrial land has risen 65 per cent on average since 2012, while residential climbed 53 per cent. Only in Delta did residential significantly outpace industrial, 69 per cent to 40 per cent. Overall, Metro Vancouver industrial real estate saw a 71 per cent hike in average values, while residential gained 66 per cent. For an investor, industrial is the better buy. In Vancouver’s Railtown, a single-storey, 8,300-square-foot building at 505 Alexander Street recently went on the market. As part of the city’s new I-4 zone, it allows for much more density, up to 52,500 square feet, with a 100-foot maximum building height, according to the Colliers International listing. Digital technology occupants are permitted, under the city’s new “creative products manufacturing” zone, along with general office use. This January the property was assessed at $5,497,700, a 120 per cent spike over the previous year. Annual taxes are more than $30,000. In Richmond, a 25,086-square-foot warehouse on .964 acres at 12951 Bathgate Way, across from Ikea, sold for $7.1 million in June 2015. This summer it was listed for $10.7 million. Letvinchuk says those investors may be less interested in industrial real estate because redevelopment potential is more often limited. He thinks the foreign buyer tax on residences could result in more foreigners purchasing commercial strata properties, which are also soaring in price. 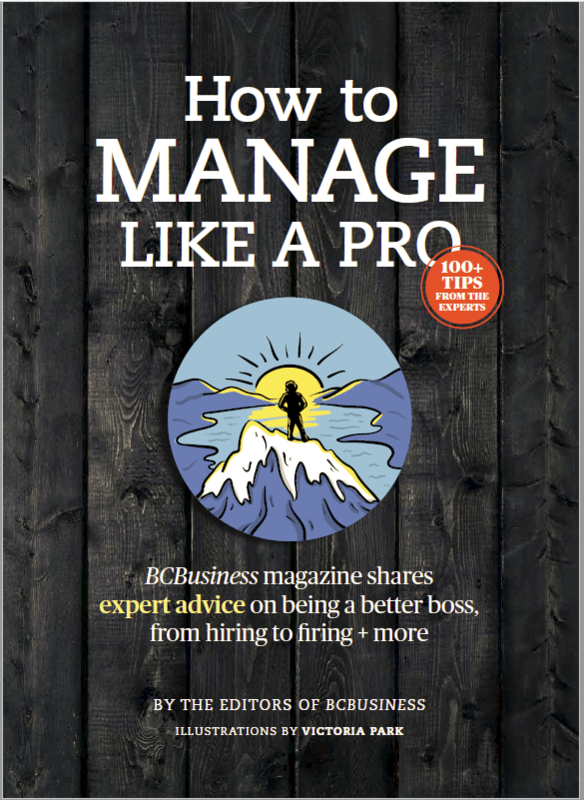 Bruno Fiorvento, Vancouver-based executive vice-president with Jones Lang LaSalle Real Estate Services Inc., which focuses on commercial real estate investment, agrees that local demand fuels the industrial market. That appetite sold out phase one of presales for Mitchell Island’s 260,000-square-foot Intra­Urban Rivershore industrial strata development, on the site of an old steel plant that was vacant for several years. The PC Urban Properties Corp. project, which Fiorvento is marketing, is Richmond’s first industrial strata development in seven years, he says. PC Urban’s first such project, on Laurel Street near Marine Drive in Vancouver, sold out within four months. The Vancouver developer had tapped into a winning product. Although sales haven’t launched yet, phase two of Rivershore has mostly sold out by word of mouth, Fiorvento says. The target market: small businesses that need high ceilings and big areas for loading trucks. The largest unit is about 12,000 square feet, but buyers can merge units to create bigger spaces. Fiorvento says “demand has been insane,” from food manufacturers, importers and construction companies. “That’s what’s nice about it—you’re building for local businesses,” he adds. Much of the demand for industrial land is from big companies looking to put down roots or to further expand into Metro Vancouver, says Curtis Scott, manager of market intelligence for Colliers Canada International. A prime example is Amazon.com Inc., which recently moved into the Vancouver area. The U.S. online retail titan occupies 236,000 square feet of distribution space on Braid Street in New Westminster, and it’s reportedly seeking more. “We have a lot of major occupiers and major companies that are looking for space and wanting to get into it for a long-term basis,” says Scott, one of the authors of a recent Colliers report on the commercial strata market. Another factor is the Metro Vancouver vacancy rate of less than 2 per cent, Neufeld says. Landlords can command $8 to $10 a square foot, making industrial property even more enticing as a revenue generator. As a reminder of what we stand to lose, many planners now prefer to call industrial land “employment land” or “jobs land.” Part of the reason people don’t think about its growing scarcity is that such property is an ugly necessity. Defined in the traditional sense, industrial land is clanking machinery, belching smokestacks, trucks moving in and out of warehouse loading bays. It’s pulp mills and fish plants, and factories that make everything from textiles to concrete. The commercial real estate industry is predicting disaster. In a May report, CBRE Group Inc. showed that at just 2.6 per cent, Metro Vancouver has the lowest industrial land availability of any metropolitan area in North America. The city of Vancouver will reach a crisis point by the early 2020s, commercial real estate services firm CBRE projects—at least a decade earlier than Metro Vancouver forecast last year. In 2017, demand for industrial property will be 2.5 times greater than the total new space being added, according to CBRE. In a 2015 study, Vancouver-based real estate consulting firm Site Economics Ltd. also predicted a crisis within 10 years as the region runs out of logistics-oriented land, or property used to move goods. Parcels of 20 acres or more are in especially short supply. The CBRE report cites Molson Coors’s inability to secure 400,000 square feet west of Chilliwack for its new brewery location. An international transportation company could only find 200,000 square feet in South Surrey, not a prime location for such businesses, due to its distance from major highways. CBRE also touches on the surge in the region’s average lease price for industrial buildings—now $10 a square foot, an 11 per cent gain over 2016. Since Metro Vancouver declared a potential crisis more than a decade ago, the industrial land base has kept shrinking. In 2016, the Metro Vancouver board announced that over a five-year period the region had lost 352 hectares of industrial-zoned land, mostly to residential and commercial redevelopment. MacCauley’s point is that we should care about losing good, central industrial land because a healthy economy relies on long-term employment. When Amazon opened its so-called fulfillment centre in New Westminster, it posted hundreds of openings for software developers and warehouse workers. In Vancouver, the upcoming Ironworks building, on Victoria Drive near East Hastings Street, will house 500 full-time jobs. These might not all be traditional industrial jobs, but they’re on industrial sites. So it falls to Metro Vancouver to protect this dwindling jobs land. Chair Greg Moore, who is also the mayor of Port Coquitlam, says an industrial land strategy is underway to address the issue of quantity and type of property most needed. It will take into account the fact that manufacturing is now more broadly defined to include animation and software development, Moore explains. The digital technology sector is a boon to the economy (see page 64), but some argue that allowing its businesses on industrial lands is hindering traditional industrial players. 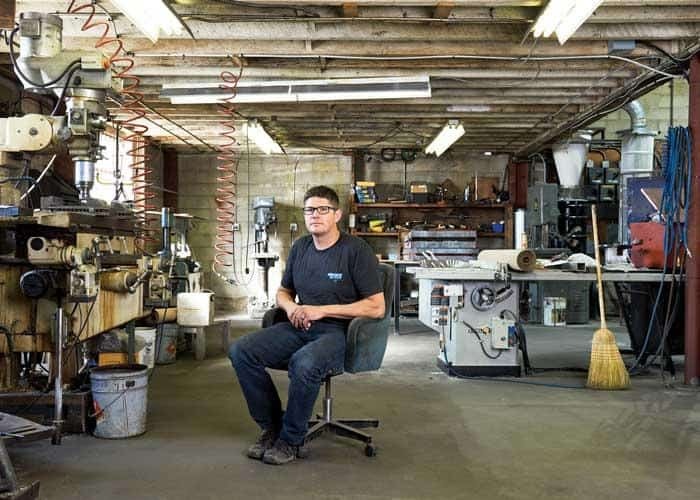 Peter Spotzl says the area around his Vancouver metal fabrication shop is under pressure from rezoning that allows for much larger buildings. As part of a plan to encourage digital tech use, the City of Vancouver created a special zone for a small parcel of land between Quebec Street and the lane just west of Main Street, bordered to the north and south by East Second and East Sixth avenues, respectively. The property’s owners, Hootsuite Media Inc. CEO Ryan Holmes and Westbank Projects Corp. founder Ian Gillespie, negotiated with the city for higher density, so it raised the allowable floor space ratio from three to five times the site coverage. As a result, Spotzl says, landlords are holding properties as they await zoning for similar density, which pushes property values and taxes even higher. And because of redevelopment potential, taxes have already risen, an expense that gets passed on to small business leaseholders like him. Luckily his landlord hasn’t raised his rent in a couple of years, Spotzl says. Then there’s residential gentrification—potentially the biggest threat. Metro Vancouver chair Moore says there’s a strong case for converting certain industrial zones to residential, such as the 33-acre oceanfront Flavelle sawmill site in Port Moody. Mill & Timber Products Ltd., which owns the mill, has come up with a master plan to turn it into a mixed-use residential, office, retail and light-tech community. At full buildout 20 or so years from now, it would increase Port Moody’s population by 7,000, or 20 per cent. City council has approved the project, which now goes to the Metro Vancouver board for a vote on whether to remove the site’s industrial designation under the Regional Growth Strategy. Moore expects it to be one of those rare industrial land rezonings that will pass. The site is close to the new Evergreen line, and it’s valuable waterfront property surrounded by a growing residential community. In Vancouver late last decade, City staff published a report that opposed any rezoning of the land around the Marine Drive Canada Line station to residential. In 2009, the South Vancouver Industrial Area was the city’s biggest and most affordable such zone, representing almost a quarter of its industrial jobs. The staff report, by then–director of planning Brent Toderian and assistant director of planning Kent Munro, cited several reasons for rejecting residential. Among them: incompatibility of heavy industry and housing, higher property values and the likelihood that other industrial-land owners would expect similar development rights. But in 2009, when the Canada Line came along, Vancouver-based PCI Developments Corp. won approval to rezone the site next to Marine Drive station for a five-acre, mixed-use development with 415 condos. It was the antithesis of a 14-year-old city policy to preserve industrial land that had already shrunk by 30 per cent. It also contradicted the Regional Growth Strategy policy to protect industrial property that council had supported months earlier. Toderian pointed out that only a paltry 10 per cent of the city’s land is for jobs. Municipalities have good reason to favour residential projects. Even though industrial users pay heftier taxes than homeowners, residential has a bigger payoff. When developers build condos, it’s like Christmas: they give municipalities amenity goodies such as community centres and parks. There are a few development industry responses to the industrial land crisis. 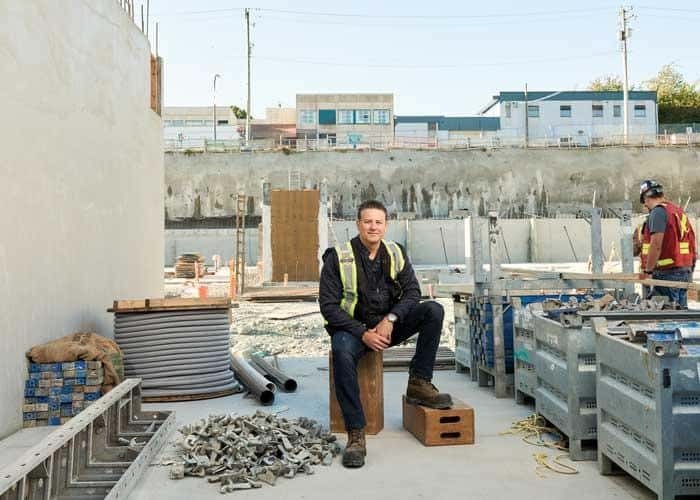 If they can’t build horizontally, some developers are going vertical, like PC Urban and Conwest Group of Cos., which are constructing multi-storey strata industrial projects on Vancouver’s east side. Conwest says presales for its 200,000-square-foot Ironworks project, due to open in about a year, were so robust that it held back on several units. 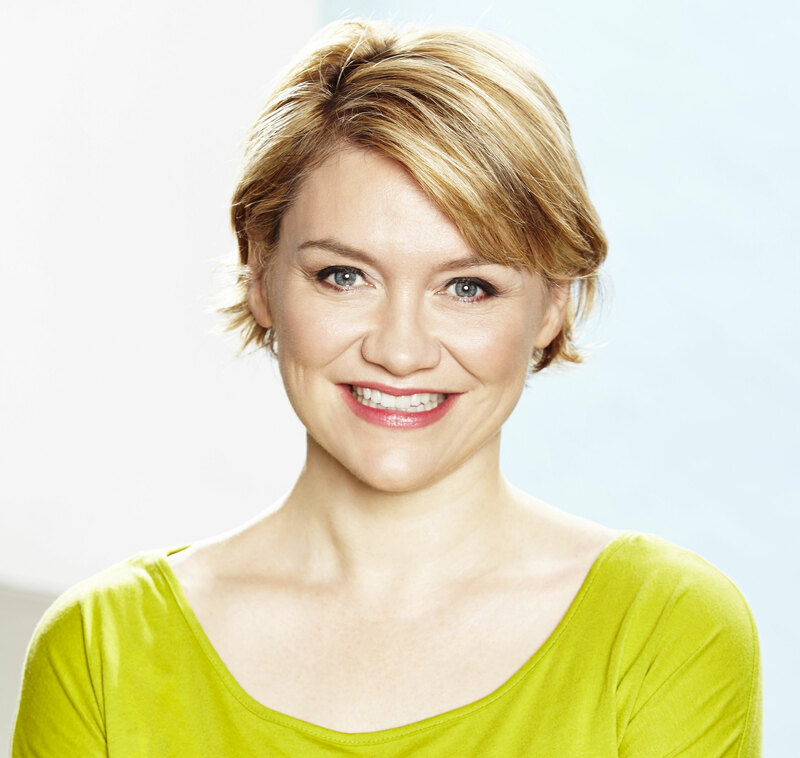 The appeal of ownership is strong for small and midsize businesses that need to stay central. (Peter Spotzl is out of luck, though: because he works with large machinery, he needs high ceilings on one level.) So far, Ironworks’ buyers have been in the service industry, light manufacturing, distribution and wholesale. Assignments are prohibited, as are speculators and investors, Taddei says. Conwest has a strict end-user requirement for Ironworks, and buyers should be established businesses. It’s one way to protect the market from empty-building syndrome, where units become nothing but holding properties. It also ensures that the local companies get a leg up. “We are being very selective on the types of buyers that purchase here, because we want to make sure they bring vibrancy and life to the building,” Taddei says. Land use policy is another possible solution. There’s pressure to take some acreage from the Agricultural Land Reserve, particularly farms that are underused or sitting as holding properties. “Nobody wants to look at it because it’s politically not a popular thing, but look at the needs for ALR, and then look at the needs for employment growth,” CBRE’s MacCauley says.